Adam Pally in Most Likely to Murder. 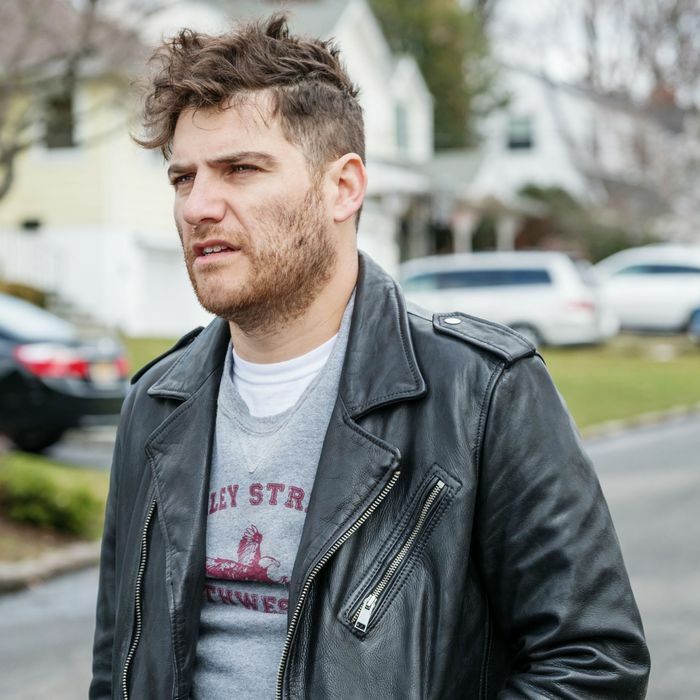 Billy (Adam Pally) returns to his Long Island hometown, washed-up and/or going to seed, but still possessing all the emotional wisdom of a 16-year-old bully that never really grew up. Within minutes, horror: His mother has sold his beloved Isuzu to the dork across the street. We still have the scooter, she offers, to which Billy retorts, “I’ll look like I’m in Garden State.” Cut to Billy, in his leather jacket, cruising down the drab suburban street, the very picture of You Can’t Go Home Again. It’s hard to believe that it’s been over 14 years since Zach Braff’s second-coming-of-age anti-classic (re)introduced us to the Shins and primal-scream therapy. The film has become a punch line in the intervening decade and a half, and a shorthand for a particular kind of film. But that hasn’t kept scores of unimaginative filmmakers from continuing to make that film, riffing on its clichés and faux profundities, all while reinforcing them even further into the language of what is still somehow considered default Caucasian indie filmmaking. Most Likely to Murder, a perfectly fine and forgettable story about a man who still has some growing up to do coming back to his childhood home, is not the worst or the best, merely the latest. The cast — Pally, Rachel Bloom, John Reynolds — are all likable people from hit and not-quite-but-should-be-hit TV sitcoms; the director, Dan Gregor, hails from the same world (and happens to be the husband of Bloom). Pally, in flailing bluster mode, plays a one-time coolest guy in school, whose life in Vegas has stalled out and is back in his hometown to help his parents move to New Mexico. His former classmates, including his ex Kara (Bloom) and Lowell, the loser he used to torment (Vincent Kartheiser), have gotten on with the business of having real jobs and/or children. But the night he arrives back in town, tragedy strikes when Lowell’s mother is found dead and Billy is the only person who suspects foul play. Is creepy Lowell actually murderous, or is Billy just deranged and bitter that Lowell got the girl in the end? As you can perhaps guess, actual mystery lovers will be let down by Most Likely to Murder, whose titular whodunit doesn’t seem written with any particularly passion or love of the genre so much as it’s an excuse to shoot a movie. And sure enough, by the film’s conclusion, it’s batted away like so many cobwebs in mom’s attic, some dusty business to get out of the way in the search for the same old bin of Legos you dig out every Christmas. Unlike, say, Search Party, Most Likely never quite figures out a way to make the amateur gumshoeing genuinely suspenseful while also poking at their quarter-/third-life crises. Also, unlike Search Party, Most Likely has no idea what to do with Reynolds, so understatedly brilliant in that show and directionless here as a cop with an understandable grudge against Billy. In fact, that problem permeates the rest of the film: If we are indeed gathered not to solve a mystery or make any great ambitious work of art, but merely to hang out on Long Island, Gregor could at least show a strong hand as a director of comedic actors. But everyone feels left on autopilot, including Kartheiser, who seems to be playing a different flavor of borderline-unbelievable creepy in each scene. At its heart, Most Likely to Murder has nothing much more on its mind than Garden State did 14 years ago, which makes the dig, made early in the film, backfire so unflatteringly. Braff’s debut film may be remembered as an overly earnest, sophomoric cringe-fest, but one must admit that it’s at least remembered.